How to protect fruit from Birds and Insect Pests. Birds can be a real problem in the garden especially in orchards at fruiting time and when new seed is planted for lawns and such, so what are the effective methods of protecting the fruit on the trees or scaring birds away. The most widely used method is Bird Netting, it is reasonably effective and is widely used in commercial orchards to keep birds away from fruit crops. Bird Netting is placed over fruit trees to stop access to ripening fruit. 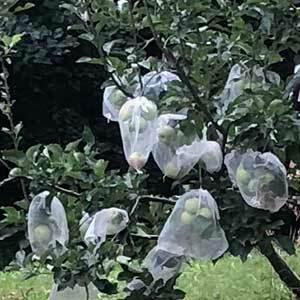 Mesh bags for the protection of fruit are an alternative to netting a whole tree. You can either make up your own from bird netting or you can buy the bags in packs from hardware stores or online. Draw string type bags come in a range of sizes to fit different fruit trees and are easy to use. These bags are usually reusable and can also be used to protect the forming fruit on pomegranates and native citrus tree. Fruit protection bags differ a little in that they are designed to protect fruit from fruit fly and other insects as well as from sunburn. They also act as a a deterrent to and provide some protection from birds. Bird scarers work differently and come in a range of types, all with merits depending on application. Infra red Bird scares work in a number of ways, one particular type works by detecting birds through the use of infra red detection sensors and thus activating a short high pressure burst of water from a sprinkler, this system works on batteries. Humming line is strung through orchards, it vibrates in the wind and produces a sound that will help deter or scare birds. Activated by motion, infra red bird scarers either emit sound, or a burst of water that is designed to scare birds away. Bird Scarers, Bird Repellent and Bird Netting are all widely used in the garden and include devices such Hawk Bird Scares, Humming Lines, Infra red bird scarers, Bird Netting, Gas Guns and Electronic Bird Scarers. Humane Bird Deterrents all work by providing an unpleasant experience for the bird and deterring or scaring it from coming back to fruiting trees, newly planted lawns etc. Contact your local RSPCA for advice on protecting plants from both domestic and native birds. The aim is to have a peaceful co existence between food crops, horticultural production and birds.